Home » Health » What Is An Influenza? Influenza or Flu is an infection of a virus that attacks the respiratory system ( a system consisting of the nose, lungs and throat ). Common cold symptoms include fever, headache, coughing, aches, decreased appetite, and sore throat. The incubation period for flu viruses is brief. You will experience symptoms in only one to three days after first being infected. The period in which the most contagious flu is on the day when symptoms begin to appear for the next three or seven days. Many people think that flu is a cold because of the similarity of symptoms, but this is not appropriate. The type of virus that causes flu is different from the common cold. In addition, flu tends to have a shorter incubation period with more severe symptoms that can hinder the patient's routine. While colds generally appear gradually with milder symptoms that do not have an impact on the patient's routine. Handling a doctor is not needed in most cases of flu, because this disease generally can heal by itself. Some of the self- medication steps you can take include getting enough rest, drinking a lot, and keeping your body warm. You can also take paracetamol or ibuprofen which can be purchased at the pharmacy to reduce fever and reduce pain and aches. You are not recommended to take antibiotics because this drug is only intended for conditions caused by bacteria, while the cause of flu is a virus. Patients with serious or chronic diseases such as heart failure , lung disease or diabetes . People with a decreased immune system, such as people with cancer and HIV. Flu viruses can be transmitted through saliva grains released by patients when sneezing or coughing. In addition, objects that have been contaminated with the flu virus can also be a medium of transmission. The main step to prevent this disease is to maintain cleanliness. Don't forget to wash your hands before eating. For public vehicle users, it is recommended to wear a mask while traveling. Other flu prevention measures are vaccination. But this method is only recommended for those who are more susceptible to flu complications. Sneezing, nasal congestion, or runny nose. Most flu sufferers recover in less than one week. Even so, some people still experience coughing or fatigue for the next few weeks. 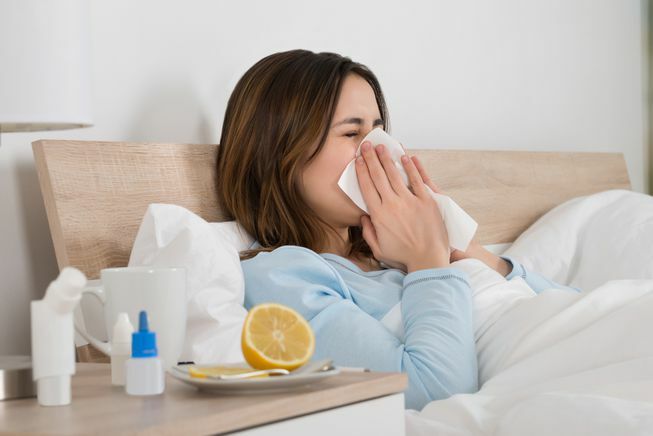 You fall into the category of people who are susceptible to flu complications, such as pregnant women, seniors, people with chronic diseases (lung or heart disease), and people with a decreased immune system. The flu symptoms that you experience are not reduced at all, getting worse, or just don't go away after seven days. Flu is caused by influenza viruses that can be transmitted directly or indirectly. One example of direct transmission is when we accidentally breathe in saliva in the air released by flu patients through sneezing or coughing. Another example of direct transmission is when we shake hands with flu patients after their hands hold their mouth or nose beforehand. Indirect transmission is generally mediated by objects that have been contaminated with the virus. We can be infected with flu if you hold the surface of an object that has previously been exposed to splashes of saliva from patients. Flu viruses can survive on the surface of objects for one day. Examples of objects that are often the intermediary media for transmitting flu viruses are door handles, telephones, or computer keyboards. Flu usually doesn't need to be handled by a doctor. You can treat this condition yourself at home. The simple treatment steps you can take include getting enough rest, eating fruits and vegetables, and keeping your body temperature normal. Increasing fluid consumption is an important step so that we avoid dehydration which is one of the complications of the flu. When you have a cold and are dehydrated, your body will lose sugar, salt and liquid. You can try drinking liquids containing sugar and electrolytes / ions to restore fluid balance in the body. In addition to the steps for self-handling above, you can also take over-the-counter medicines if needed, such as paracetamol or ibuprofen . Both of these drugs can reduce fever and reduce aches. You are not allowed to take antibiotics because this drug only serves to kill bacteria, not kill the virus as the cause of the flu. There are several groups of people who are susceptible to complications due to flu, including pregnant women, the elderly, people with low immunity, and people with serious diseases (such as heart failure ). Therefore, doctors will usually give antiviral drugs to those at risk. There are two types of antiviral drugs currently widely used to treat flu, namely oseltamivir and zanamivir. However, the benefits and side effects of these two drugs are still being debated to this day. Several studies have shown that tamiflu has been shown to be less effective in reducing the risk of complications due to flu. In addition, around 50% of patients who take this drug show symptoms of side effects that are quite serious, including the effects on innervation, psychological conditions, and digestive system. Consult your doctor to get the right therapy. Flu generally heals without causing complications. Even so, you are advised to be careful because the immune system when suffering from flu will decrease, making it easier to contract other diseases. Similarly, people who are more susceptible to complications, such as pregnant women, the elderly, people with a decreased immune system, and sufferers of chronic diseases (such as lung disease). Lung infection . The type of lung infection most often experienced by people with flu is bronchitis. Bronchitis is an infection in the main respiratory tract called the bronchi. In some cases, more severe complications can occur, for example pneumonia (pneumonia). Worsening flu symptoms . In people with long-term (chronic) health problems such as asthma or COPD , flu symptoms can be more severe than normal people. Increased blood sugar in diabetics . In addition to increasing blood sugar, flu also has the potential to trigger the condition of diabetic ketoacidosis in people with type 1 diabetes mellitus. Premature birth . In pregnant women, the risk for infection due to flu will increase. Flu can also increase the risk of premature birth or very low birth weight. In addition, there are several other types of complications that can also be triggered by flu. Among them are swollen tonsils (tonsillitis), ear infections, bronchitis , severe dehydration , and meningitis . In people with flu, dehydration also has the potential to occur due to a sense of reluctance to drink due to a sore throat and felt fever. In addition to adults who have a weak immune system, children are also prone to dehydration, especially those aged under two years. Always wash hands, for example before eating or after traveling. Closes the mouth and nose when sneezing or coughing. Wear a mask when traveling (especially for users of public transportation) or when around flu sufferers. Ensure that the body receives adequate intake of vitamins and nutrients. All people aged 65 years or more. Children and adults with chronic diseases such as asthma, diabetes, kidney disease, and children with weak immune systems. People who are often exposed to influenza viruses, such as health workers, people who live in homes with sufferers, and caregivers of children aged 6-23 months. Influenza immunization is also given to healthy children aged 6-23 months. Vaccination in children can be done since they are six months old with the frequency of repetition once a year. In children and adults with low immune system, giving is only given twice a month after the first vaccine administration. People who experience severe allergic reactions (anaphylaxis) in previous vaccines. People who after eating eggs experience swelling in the lips or tongue, or experience respiratory distress or fainting. Someone who is experiencing a high fever. Side effects of influenza vaccines include fever, cough, sore throat, muscle aches , and headaches. While the rare side effects are sneezing, shortness of breath, ear pain, and itching. 0 Response to "What Is An Influenza?"